Candidate must possess at least a Bachelor’s/College Degree, Architecture or equivalent; Preferably 1 – 2 years experience, specializing in Architectural Design or equivalent; Knowledge in Sketch up, MS Office, Adobe Photoshop, Autocad; Willing to work extended hours (overtime with pay is always required); Can work in a minimal supervision in a fast-paced environment; Excellent communication skills both oral and written. With extensive experience in the same field of work. Female; Graduate of any 2 – 4 year course; At least 5’3” in height; Proficient in oral and written communication skills; Must have strong assertive skills in handling customer problems; Skilled in inventory procedures; Preferably with background in sales, customer service and basic inventory management; Flexible and able to work in high stress/pressure situations; Can perform cashiering functions; Must possess strong leadership skills; Willing to overtime and during holidays; keen and alert; Stylish and passionate for clothes. At least College level; With pleasing personality; With experience in restaurant. Male / Female; A graduate of any Course; With at least 3 years Call Center background; Experience in handling Australian Accounts / Client is an advantage; Used to a high pressure, customer oriented environment; Intermediate skills in MS Outlook; Basic to Intermediate skill in Internet Explorer, Word, Excel, and Power point; Excellent communication skills and customer service skills; Previous experience with TSM; Available to start immediately; Willing to take in the night shift. 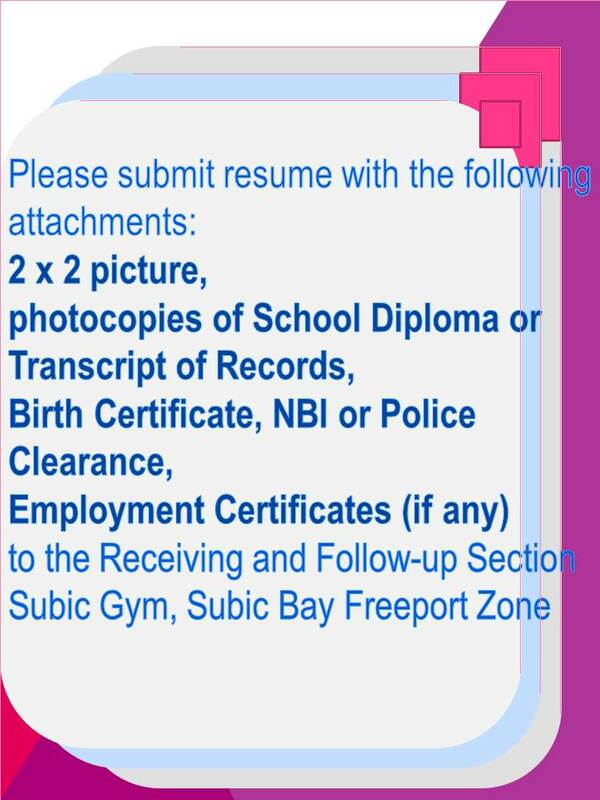 Candidate must possess at least a Vocational Diploma / Short course certificate in any field; At least 2 years work experience in driving preferably within a company; With valid Driver’s License; An energetic, enthusiastic and confident individual; Keep on details and in following instructions; Hardworking and trustworthy; Must be willing to work in the Subic Bay Freeport Zone. Male / Female; Business Administration graduate or any related course; Can deal with high pressure and customer oriented environment; Intermediate skills in Outlook; Basic to Intermediate skills in Internet Explorer, Word, Excel and Power point; Previous experience with TSM and Eclipse is an advantage.